All Indian brides and grooms want to have beautiful wedding photography, so I put together this list of FAQs to help ensure that every couple has the best possible information to ensure a beautiful photography outcome. My experience shooting hundreds of Indian weddings all over the world has given me unique insight into what works and what doesn't. I hope this information is helpful to you. 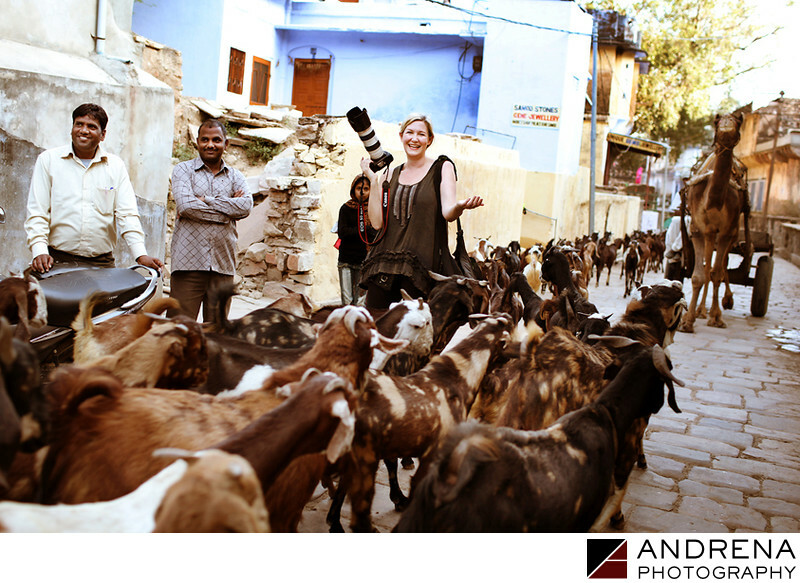 Here's a photo of me in a goat storm in Samode, India, about an hour from Jaipur. How many hours will I need a photographer for? Most Indian weddings require anywhere from 14-16 hours of photography time on the main wedding day. Additional events vary in length, usually involving 3-6 hours per day. We generally start documenting your wedding during the bride's getting ready preparations (when you start makeup). It’s during this time that we shoot the bride's details (lengha or sari, jewelry, shoes, rings, etc. ), as well as her transformation into a bride. We also shoot the groom's details and getting ready preparations. This means that we usually start very early in the morning and work very late. We always want to include time for getting ready, individual portraits, first looks, bride and groom portraits, the baraat, family photos, portraits in your reception outfits (time permitting), décor photography (ceremony and reception) and your reception festivities (grand entrance, first dance, cake cutting, toasts, performances and open dancing). How many hours of reception coverage do I need? It depends on the length of your program and guest count, but we usually find that four hours is just about right. We have stayed at receptions as long as eight hours, but at a certain point, it is just the same 30 people dancing. So it’s totally up to you. We can usually cover everything and get a good amount of dancing documented within four hours. How many hours of sangeet coverage do I need? We usually recommend four hours of coverage for sangeets. Three doesn't seem to be enough, while five seems to be overkill. My uncle has a great camera and really wants to photograph the wedding. Is this OK with you? You have hired your professional photographers and videographers to do the best job that they can for you. Excited relatives may not realize that they are often preventing your paid visual teams from doing their best for you. We encourage our clients to ask their relatives to put their cameras away during the ceremony, as this is the time when shots can be ruined by iPhones, iPads or semi-pro cameras. The last thing your visual teams want is to be competing with guests to do their job. Please let them know that we will give you all your files, and that you will be happy to share those files with them at a later date. How long will it take me to get ready? It usually takes an Indian bride three hours to get ready. That’s one hour for hair, one hour for makeup, and one hour to get dressed (which includes putting on bangles, tikka, bindi, earrings, payals, necklaces and shoes, as well as wrapping the dupatta on a lengha, or getting the sari situated just right). Why does it take so long to get ready? A hair and makeup trial may take 45 minutes, but on your actual wedding day, your hair and makeup team will have a lot more work to do, and will want you to look perfect. There will also be interruptions by your visual teams (photographer and videographer) that may slow them down, as well as visits from friends or relatives. When getting dressed, your visual teams will start to really slow things down, as we may need you to put jewelry on more slowly than normal, and to change the positioning of your hands or body to create a more beautiful image. Your video team might also need to stage a shot several times (perhaps of you opening a gift from your groom, etc. ), which can add time. Finally, the positioning of the dupatta can take a very long time (including many conversations among helpful aunties). So it’s best to allow at least three hours. If you’re always running late, it’s best to allow three and a half hours. Should I have all my friends and family in my getting ready room? It’s your wedding, so you can absolutely do what you want. But most photographers and videographers agree that we can do a better job if we’re in a clutter-free environment with room to move around. I have worked in getting ready rooms that have 30+ people in them, and I have worked in getting ready rooms that have the bride, her hair and makeup teams, and her visual teams only. The latter is usually less stressful for the bride, and provides less distracting backgrounds for your photographs. Having fewer people also provides your photographers, videographers, and hair and makeup people with more room to work. Your prep and visual teams also need room to set up their equipment. As a rule, the less clutter, the better. How long will it take for me to change into my reception outfit? Most Indian brides change their hair, makeup and outfit before their reception. This process can take anywhere from an hour and 15 minutes to two hours. Make sure you allow enough time after your ceremony and before your grand entrance to complete your reception look. If you are doing family group photos and bride-and-groom portraits after your ceremony, then changing into your reception look, you just need to allow enough hours for this in your timeline. Can we do portraits in our reception outfits before the reception? I love to do portraits of a couple in their reception outfits before their actual reception. But my ability to do so is predicated on when the bride and groom are ready. If the grand entrances are scheduled at 8 p.m., and the bride and groom come downstairs at 7:45, it is unlikely that we will have time to take portraits before your reception. But if there is a long enough break after the ceremony, and the bride and groom are ready long before their grand entrances, we would be happy to do a portrait session in your reception outfits. We also love to photograph portraits of the immediate family in their reception outfits. Our ability to do so just depends on when everybody is ready. I’ve heard that sindoor used during a Hindu ceremony can stain other parts of my skin. How can I avoid this? Sindoor is a red pigmented powder that is put in the bride’s hairline part as part of the Hindu ceremony. It signifies that she is a married woman. Unfortunately, it is a very strong dye, so if it falls on your nose or cheeks, and you try to brush it off, it will just make your nose and cheeks very red (and that red just does not come off without serious soap and water). The best way to avoid sindoor falling on your face is for your groom to hold the back of his hand just under your hairline part, just below where he will place the sindoor. That way, if any sindoor falls when he is placing it on your hairline, it will fall on the back of his hand, not on your face. I’m South Indian and my groom dumped a huge bowl of rice on my head at the end of our ceremony. So my hair is full of rice! Yes, it is. But it’s OK. We can just shake it out as much as we can, and then do your family photos. It really won’t show as much as you think it will. Neither Hindu nor Sikh ceremonies include a recessional, but I see lots of recessional photos on your web site. Why is this? Though neither Hindu nor Sikh ceremonies traditionally include a recessional, I find that it creates a wonderful photograph to include in the bride and groom’s album. I thus encourage our couples to do a recessional, then to circle back to the front for group photos. South Indian wedding ceremonies sometimes include post-ceremony blessings by all the guests. Is this something we should do? While this is a lovely tradition, individual blessings can actually take two hours. If you have enough time in your timeline, and your guests have somewhere to go, this would be fine. But for most weddings, it’s better to do a recessional (signifying that the ceremony is over), and then do your group photos. It’s sad that there is no time for blessings, but there really isn’t. Our ceremony starts very early in the morning, so we won’t have time to do a first-look. Can we do portraits after our Sikh ceremony? Sikh ceremonies generally have to conclude by noon. This means that the baraat is usually at 9 a.m., with a welcome breakfast (and chai) for the guests before the ceremony. Given this tight timeline, it is not usually possible for brides and grooms to see each other before their ceremony for portraits. This means that all our bride and groom portraits have to be done after the ceremony. If you are having a luncheon at a gurdwara, you will probably need to put in an appearance before we can head off to a more photogenic location. Many gurdwaras have parks nearby, or we can always head back to your reception venue. My ceremony is at a Gurdwara, but I’d rather do my family photos somewhere else. Is this possible? Of course. We’ve worked at most of the gurdwaras in Los Angeles and Orange County, and while they are lovely places for a ceremony, they are not always as photogenic as your reception venue might be. We can either take group photos in the gurdwara after the ceremony, when various friends and relatives come to bless and greet you, or we can regroup back at your reception venue and take the group photos there. It is entirely up to you. If we are going to leave the gurdwara for bride and groom portraits, it will probably make the best sense to do the family photos at the gurdwara before we leave. That way, when we get to your reception venue, you can head right up to your room to change into your reception outfit. We have a very long list of family group photos that we would like to do. How much time will you need? For most Indian weddings, family group photos are an important part of the day. Relatives who have traveled long distances want to be remembered, so they often expect the honor of having a photo taken with the bride and groom. The hard part about this is that your guests don’t realize what a tight timeline you have, or that you have to get back to your room to change into your reception outfit. The amount of time a photographer needs to create all the photos on your group shot list will depend on the number of groups, and the number of people in each group. The bigger the group, the longer it will take to set up. If your parents envision a historic photograph featuring 75 family members, we are happy to create that image for you. But we will need to set up chairs and organize people (to ensure all faces are visible), and this takes a while. We occasionally get lists of 38 group photos with only 15 minutes of time allotted on the timeline. This just isn’t enough time to move people. Also, it’s helpful to remember that every single person who walks onto the mandap for a group photo will want to hug you and tell you how great you look. They might even want to introduce you to their significant other. All of this love can slow things down. If you have long lists of family photos on each side, it's best to allow ample time on your timeline. How should we organize our family group photo lists for maximum efficiency? The most important groups are the ones you will include in your wedding album. These include your entire bridal party, bride with bridesmaids, groom with groomsmen, bride and groom with both sets of parents, bride with her immediate family, and groom with his immediate family. We then recommend doing the biggest group photos, so you can then excuse those people to your luncheon or cocktail hour. After the main must-have photos are done, any image that will involve chairs should be done next (so we don’t have to set up, tear down, and then set up chairs again). Small groups (individual families, etc.) take less time than larger groups. Should we do all the photos for one family side first, then for the other? I have seen this type of group shot organization create a number of issues, as one side may have a very long list, thus meaning that the other side is waiting around for 45 minutes, unable to go to the luncheon or cocktail party. We thus find it better to kind of mix it up, and photograph groups as they are ready. Should we have someone calling out names from our respective family photo lists? Yes! Absolutely. We find that it works best to have a loud male relative on each side to organize the groups. This person should not be the coordinator or coordinator’s assistant, nor a female family member. It should be a loud male relative. Our ceremony is mid-day, in bright sun, so we want to put a colored fabric panel on the top of our mandap (rather than leaving it open). What color should we use? Mandap-top fabric panels can be great, as they help even out strong overhead light. They also can help minimize harsh shadows on faces during the ceremony. When thinking about a colored fabric panel on top of your mandap, you have to think about how the color of the fabric will affect your skin. One of my clients had a mandap with a dark red fabric panel on top. As the sun shone through the fabric, the bride and groom’s skin turned purple. Another client used a dark orange fabric panel, and their skin turned orange. Likewise, a yellow panel would turn your skin a dark yellow. If you are going to enclose your mandap top with a fabric panel that sun will shine through, it’s best to use a light color, such as white, off-white, pale lavender or a very pale gold (not yellow). How much space should we leave between the mandap and the first row of guest chairs? Your visual teams (photographers and videographers) will need to move around in front of your mandap. Videographers are often working with stationary tripods, while photographers may be kneeling or squatting in front of your mandap or in the aisle. You thus want to leave a good amount of space between the mandap and the first row of chairs to ensure your visual teams have enough room to move around. A wide aisle is also helpful to your respective visual teams. We want to have our sangeet on Friday night, but our wedding starts very early the next day. What time should we leave the sangeet? A late-ending night-before sangeet might mean a lack of sleep for you before your wedding, so we recommend that you start the event little earlier and exit the event a little earlier, just to ensure you get enough sleep. Remember, you might have to drive to a hotel room, get up to your room, get undressed, take off your makeup, and then unwind from the festivities. If you’re like me, you can’t sleep well when you know you have to get up in three hours. Many Indian brides start hair and makeup at 5 or 6 a.m., so I think it’s important that a bride gets back to her hotel room in time to get a good night’s sleep before her wedding day.